Joe De Sena accomplishes pretty much anything he sets his mind to. At a young age De Sena built a small business around selling fireworks, and then started a t-shirt sales business before launching a successful pool cleaning business in his teens that he later sold for a healthy profit. After graduating from Cornell, De Sena worked at a Wall Street brokerage firm as an equities and derivatives trader where he built a rather healthy nest egg for himself. On top of his professional accomplishments, Joe DeSena is no ordinary fitness enthusiast. This is a guy who has, at one point, completed over 50 ultra events and 14 Ironman races in just one year while also finishing the Iditarod…by foot. Joe’s obsession for overcoming life’s obstacles led him to pioneer the field of Obstacle Course Racing (OCR) as a vehicle for affecting positive change in people. Joe’s passion led him to create the Peak Races, followed by the Death Race, which later evolved into the Spartan Race series. Often described as a true test of willpower, the Spartan Race is known to push minds to its limits with standard obstacles round the world such as the wall climb, barbed wire crawl, fire jump, tire flip, rope climb and more. Joe will be the first to tell you that none of these adventures would be possible without fueling one’s body with the proper nutrition required to sustain peak performance. And when it comes to putting the right nutrition into his body, Joe feels the same for his sidekick Marcus who often joins him on his extended hikes and race courses. See their story in the video above. Marcus is a strong, active dog that needs a protein boost on those long races and hikes. 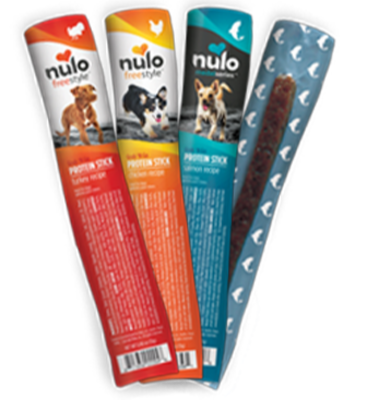 So Joe likes to carry these Nulo Protein Sticks when he and Marcus are putting in the miles.